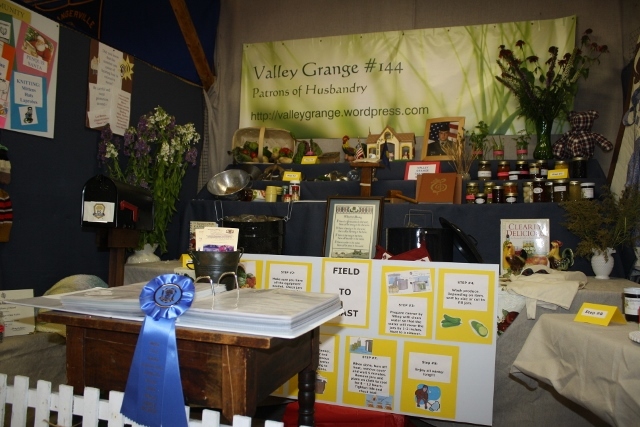 Valley Grange walked away (well, some of us shuffled… it was a lot of work taking the booth apart) with the first place ribbon for our booth display at this year’s Piscataquis Valley Fair! We’d already agreed it was our best booth in recent years and are glad the judges agreed! The booth followed the theme of “Field to Feast” and included step by step instructions and materials for preserving the harvest. Our judging guidelines also call for us to tell as much of the “Grange Story” as possible, including information and samples of our Community Service, Family Health and Hearing, and CWA work. Community Service Chair Mary Annis turned out an incredible poster with colorful pictures and descriptions of some of our projects. While we all mutter and complain, we really do enjoy working together to build the booth every year on what usually turns out to be the hottest day we have in August. This year the crew included Mary and Jim Annis, Judy and Roger Ricker, Linda Erwin and Bob Carroll and Janice and Walter Boomsma. We can always count on Roger for some bad jokes and Judy is constantly sweeping… Mary and Janice do most of the preliminary work… and just about everybody gets a turn being sidewalk superintendent. Congratulations to our closest (and only!) competitor, South Sangerville Grange for a well-deserved second place ribbon. Walter set up the Pomona Membership Booth again this year in an effort to assure fair-goers that the Grange is alive and thriving in the area. Unfortunately, Garland Grange was unable to compete this year, but we hope they’ll be back next year! Space in the Grange Exhibit Hall is always filled. This year we were joined by 4-Hers with their project work–they were great neighbors and added a lot of fun to the hall. That blue ribbon looks great! The paper hits the stands today… and it’s free! Thanks, Grace! Valley Grange Takes Third Place at Fair! Valley Grange extends hands of friendship and invites you to consider joining us! Ok, ok… that’s called “editorial license” and giving the story a “slant.” The facts are that there were only three Grange Booths in competition and South Sangerville received the first place blue ribbon; Garland Grange the second place red. And since this is OUR site, we’re allowed to slant the story and even suggest that we’re convinced we had the most fun planning and putting the booth together! The guys had some “very important jobs” during construction… and it really was a team effort. 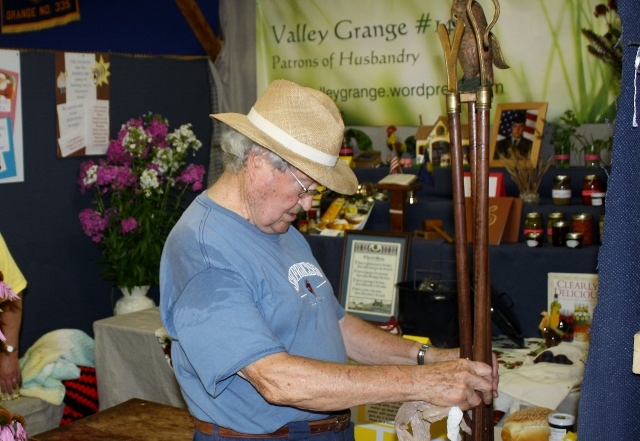 Exhibits remain in place until Sunday… so when you visit the “fayuh” this year, stop by and see what the Grange is doing! Neighboring East Somerset Pomona also has a display and the Piscataquis Pomona booth offers information about all the Granges in the area. While you are at the fayuh, wander through the 4-H building and check out the kid’s work… and don’t miss the special tribute to 4-H leader and volunteer Linda Whitten. Most know Linda recently lost her battle with cancer. She will be deeply missed by many and it would be more than appropriate to honor her memory by spending some time there. An even greater honor would be to consider volunteering a few hours of time to work with 4-H… introduce yourself to a leader and get acquainted! If distance or other factors keep you from visiting this celebration of agriculture in person, check out the daily photos being posted by Judy Wilbur Craig, visit the Fair website, or get the news at the DailyME site. Linda Whitten of Milo, ME, has been battling cancer for a number of months. Her friends from University of Maine Cooperative Extension, 4-H Clubs, 4-H After School and Milo Rite Aide staff are sponsoring a benefit spaghetti supper and silent auction to help Linda with her medical bills associated with being a cancer survivor. Please join us Friday, July 23rd at the Milo Town Hall to enjoy a delicious spaghetti dinner cooked by Val Robertson from Hobbnobber’s Pub serving from 5:30 pm to 6:30 pm. The meal will be by free-will donation. It will include a special dessert contest by 4-H Youth. Silent Auction begins at 5:00 pm and ends at 6:30 pm, with announcing of winning tickets until about 6:45. From 6:45 pm to 7:00 pm Awards Program for 4-H youth in appreciation of Linda’s contributions to the 4-H Youth Development Program. Items for the silent auction can be dropped off before July 20th at the Extension Office in Dover-Foxcroft. If you are unable to come to the dinner and auction but want to help Linda an account has been set up at the Maine Highlands Federal Credit Union payee “For the Benefit of Linda Whitten,” mailed to Maine Highlands Federal Credit Union, P.O. Box 507, Dover-Foxcroft, ME 04426 or contact Barbara Baker at 207-942-7396 or email Barbara.baker@maine.edu. 4-H is Alive and Well! As part of my work with the Executive Committee of County Extension, I recently got to see and hear a great presentation about some of the things being done by and with 4-H and to “see” the kids and some of their adventures through photographs the kids took themselves. For a real treat, visit their blogs: Milo 4-H, Brownville 4-H, and Lagrange 4-H. There are over 60 kids involved in 4-H in these three programs. By the way, did you know about the Pine Tree State 4-H Foundation? I also got to meet the new director, Audrey Chapman and learned a little bit about their work. The Foundation was established in the 1960’s to aid in the financial support of the UMaine Cooperative Extension 4-H Program and they offer grants and scholarships and various other support to local 4-H clubs and individuals throughout the state. I’ve added these links to this site as well as a link to the UMaine Cooperative Extension 4-H Site. Of course you can always call your local Extension Office for more information. By the way, the Piscataquis County 4-H Awards program is scheduled for Friday, July 23rd at the Extension Building on Main Street in Dover Foxcroft. If you’re interested in bringing a potluck dish to share and meeting some great kids, contact Barbara Baker for more information.